My guess is that the record label put this one together. A 2-CD set that can't quite make up its mind what it wants to be, it's missing a lot of essential tracks by both Dire Straits and Mark Knopfler. Where are "Twisting By The Pool," "Lady Writer," and "The Bug"? And how about "Darling Pretty" and "Back To Tupelo"? There's nothing here from Knopfler's side projects with the Notting Hillbillies or Chet Atkins. The sequencing is awkward and unimaginative. Starting with the fourteen-minute "Telegraph Road"? Moving in strictly chronological order? Oh, well. Those complaints aside, it's always a pleasure to hear Knopfler. From the moment he hit the scene in 1978 with "Sultans Of Swing," you knew you were in the presence of an authentic voice. Part Dylan, part Springsteen, part B.B. King, the craggy Brit transformed his influences into something fresh and original. 27 years later, "Sultans" still crackles with excitement. 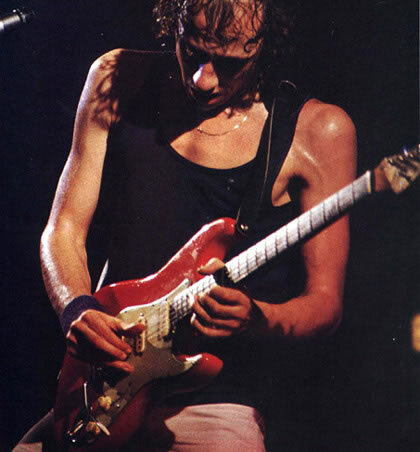 I get goosebumps when I hear the lines "You check out Guitar George he knows all the chords / Mind he's strictly rhythm he doesn't want to make it cry or sing," along with Knopfler's bendy Stratocaster licks. The soulful guitar playing is matched by the songwriting. On Disc One, "Love Over Gold" poetically captures what it means to be an artist, while the dynamic "Tunnel Of Love" explores the spark and innocence of your first great romantic affair. "Skateaway" is a love letter to how rock 'n' roll can transform small-town dreams ("But the music make her wanna be the story / She's making movies on location"). Ironically, given that couplet, it would be MTV that would turn Dire Straits into a platinum-selling juggernaut, with Top 40 smashes like "Walk Of Life" and the still annoying "Money For Nothing." Disc Two explores solo Knopfler territory, with his forays into film scoring. The Gaelic-flavored "Going Home" (Theme From Local Hero) and "The Long Road" (Theme From Cal) both show a flair for drama and cinematic sweep, while "Sailing To Philadelphia," a duet with James Taylor, sets the immigrant experience to atmospheric blues. In the shoulda-been-a-hit "Boom, Like That," Knopfler sings from the point of view of Ray Kroc, the man who founded McDonald's, comparing the tycoon to a rock star (Kroc star). The collection ends with "All The Roadrunning," a preview from the forthcoming duet album with Emmylou Harris. The two sound like old friends singing together, though once again, I had the sneaking suspicion that this whole release was nothing more than the label's hastily assembled trailer for Knopfler's next album.